Fill your personalized journal with joyful moments and memories! Note: Pattern may be traced onto book cover or used as a diagram forplacement. 1. Turn your iron onto the highest heat setting and allow it to heatthoroughly. 2. 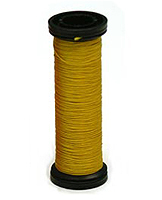 Following pattern and beginning with top flower, make a swirl with goldiron-on thread. 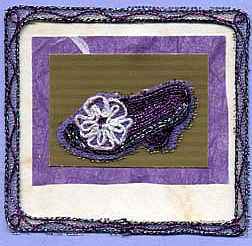 With pink iron-on thread, make 6 petal loops and iron on one byone. Repeat with bottom flower. 3. 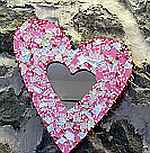 With confetti pink iron-on thread, make butterfly body and iron in place.Use blue iron-on thread for heart-shaped wings. 4. 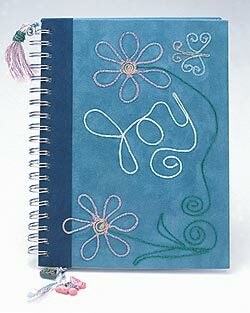 Using pearl iron-on thread, write "Joy" or desired name orphrase onto the center of the book. Press iron onto top, center and bottom ofletters to hold, and then iron entire word. 5. Using green iron-on thread, make leaves and stem. 1. Cut a 40-inch length of pearl thread and fold in half (to be used ascenter holding cord). 2. Cut an 80-inch length of each pink and blue thread. Fold in half withwhite thread in center. Tie an overhand knot with all threads about 1 1/2"down from loop. Attach to book by pulling threads through loop above knot. 3. Using two strands of thread on each side, tie square knots until desiredlength (approximately 11 inches). Thread and tie butterflies onto bottom ofbraid about 1 inch apart. Tie at bottom and cut threads. 4. Make a tassel from all the threads and tie onto top of braid. 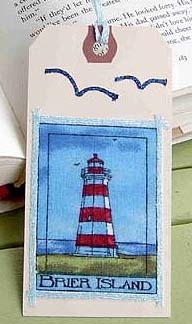 If you have trouble printing this page and would like us to send you aprinted copy send a #10 SASE to: Joy Journal, P.O. Box 1258, Parkersburg, WV26102. 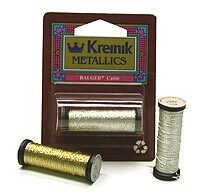 © Copyright 2005 Kreinik. May be reproduced but not sold.